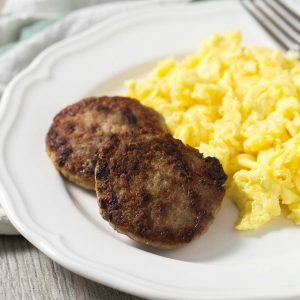 These homemade paleo sausage patties are so easy to make. Just combine ground pork and 5 spices you already have in your pantry. Much healthier, cheaper and free from preservatives than what you can buy in the store. Dovetailing Tip: Use this homemade sausage in your Fried Rice today instead of the Chinese Sausage. No need to form into patties, just crumble in a skillet and brown. In a small mixing bowl, combine the ground pork and all seasonings. Blend the meat until combined. Use a large cookie scoop to make even sized 3 tablespoon balls. Flatten with your hands until less than 1/2" thick to form the patties. Makes 8 patties. Heat a cast iron or heavy bottom skillet over medium high heat. Add the olive oil to prevent sticking and to help the patties brown. Cook the patties until golden brown and they reach an internal temperature of 165 degrees, about 5 minutes per side.